Got wind of this through their twitter feed and thought, finally they’ve come to their senses; and so I poked around to see what it was all about and lo and behold, a subscription service was present. 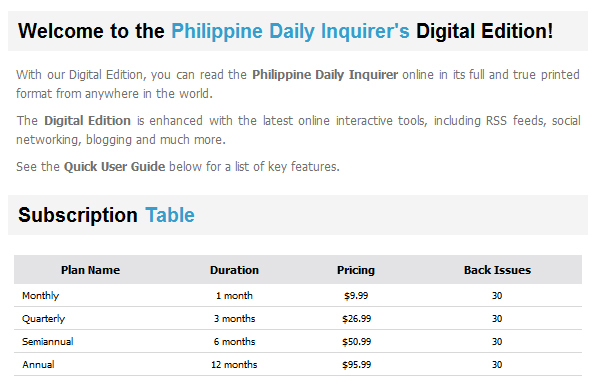 While Ive got nothing against publications going digital, the way they’re still selling it online makes little sense to me. 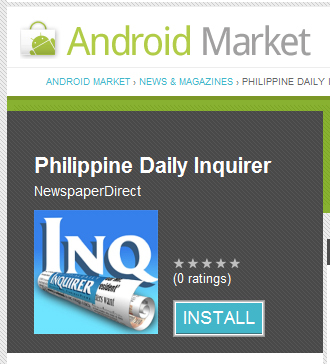 Time magazine also has an online app and you pay nothing for that, why would Inquirer not do the same? If you think about it, digital content doesn’t have production costs that would equate similarly to their printed material. People would still buy their newspapers because it delivers news in a form that caters to still quite a majority, just like how a book is best carried and read as one. The application itself is free, but that only acts as a portal to their ‘store’ and a reader. I don’t know how effective this method of delivery will be for them but I know for certain that their twitter feed, combined with several other twitter feeds from multiple news sources deliver the news almost immediately and the paper only serves as a ‘printed record’. To each his own I guess, reading a newspaper through a tablet really doesn’t give off an appropriate feeling. Any thoughts regarding the matter?